Flowers have an immediate impact on happiness. All study participants expressed "true" or "excited" smiles upon receiving flowers, demonstrating extraordinary delight and gratitude. It's obvious that flowers make people happy. The study also explore where in the home people display flowers. Flowers were display in the areas of homes where visitors could see them--suggesting that the flowers are a symbol for sharing and make the room more welcoming. According to Leatrice Eiseman, Executive Director of the Pantone Color Institue and international color expert, “Our response to color is intensely emotional, and flowers can be a catalyst for feelings that stimulate more than just our senses of sight and smell,” said Eiseman, Executive Director of the Pantone Color Institute. “An artful floral arrangement has the ability to convey a feeling or create a mood without using words, just color.” Below are five examples from Eiseman, that show how to effectively use flowers and color to affect and enhance one's mood. This is an example of a floral arrangement that would create a sense of caring. Fragile, soft, and tender colors are used, such as yellows, peacher, warm pinks, creamy white, and subtle greens. These colors make a person feel safe, snug, and love. 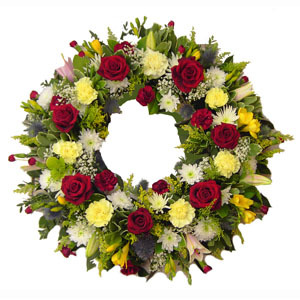 This would be a great floral arrangement for a new mother, a sick friend, or one who is grieving. Flowers used: apricot roses, yellow tulips, pale green carnations, chartreuse viburnun, yellow freesia, lavender waxflower, and heather. This is an example of flowers that create a sense of intimacy, nostalgia, and comfort with a blend of delicate warm and cool colors. 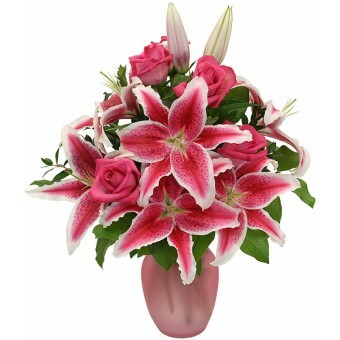 Pink is the focal point of this floral arrangement. It would be a great idea to give this type of floral arrangement to mothers, sisters, grandmothers, aunts, best friends, significant others, and brides-to-be. 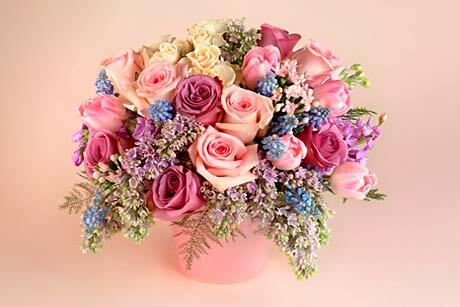 Flowers used: deep lavender roses, pale pink roses, champagne spray roses, grape hyacinth muscari, pale pink bouvardia, blush tulips, and lavender stock and lilacs, accented with asparagus plumosa. Professional florists refer to this arrangment as "Mille Fleurs," or a thousand flowers. 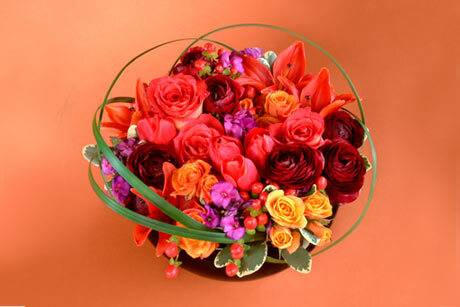 This floral arrangement is an example of one that sets the mood for sophistication, passion, and even seduction. 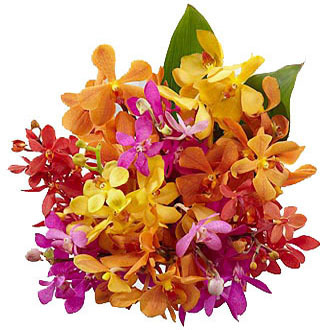 Vigorous reds and purples, hot pinks, and spicy oranges are combined to make this beautiful combination. This extravagant arrangment is great to use for very special evenings or an elegant dinner party. Flowers used: orbiting lily grass frames maroon ranunculus, burnt orange Asiatic lilies, hypericum berries, magenta pholx, and variegated pittosporum. This floral arrangment is great for anyone who needs serenity and relaxation. It's color simulate the sky and sea with their clear, light shades of green, misty blues, and other color hues. Busy moms, stressed professionals, and anyone who needs a moment of calm in their life would appreciate a bouquet like this one. 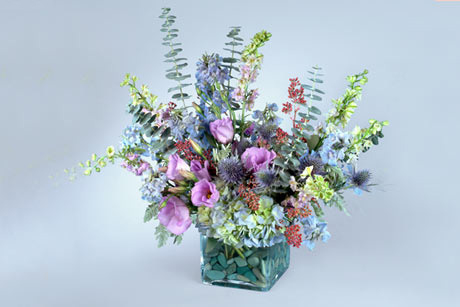 Flowers used: lavender lisianthus, lavender larkspur, light blue delphinium, light blue hydrangea, eryngium thistle, and seeded eucalyptus accented by dusty miller foliage. Finally, river rocks in the bottom of the glass cube add to the tranquil feeling given off by this bouquet. 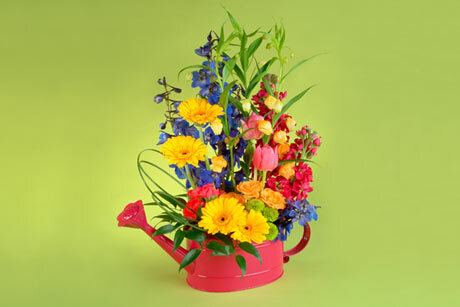 This floral arrangement gives off a fun-loving, free-spirited, playful feeling from its bold, contrasting colors. 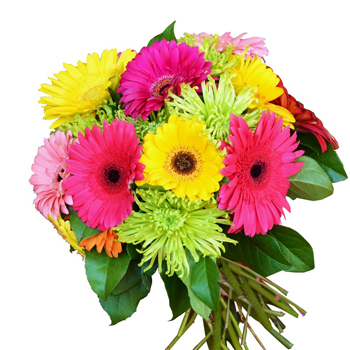 These hues set an upbeat tone and are great for birthdays, graduations, promotions, and other celebrations. 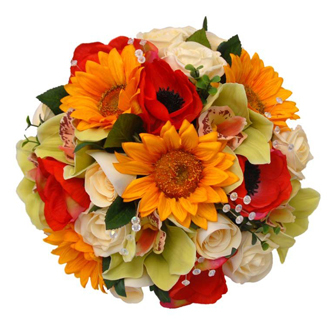 Flowers used: fuschia stock, royal blue delphinium, yellow-orange spray roses, pink tulips, Italian ruscus, and yellow-orange bell-like sarasonia over golden-yellow mini gerberas, lime-green pompons, and hot pink mini carnations. Professional florists call this floral arrangement "vegetative" for its duplication of nature as flowers would grow in a garden. 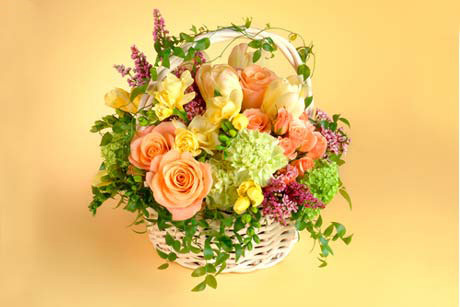 When ordering a floral arrangement or gift, describe the recipient's personality, as well as favorite hobbies or colors, which will help the florist create the best arrangement for the recipient's personal preferences. 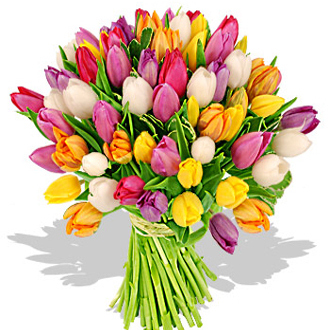 Tell the florist if the gift is for a special occasion or just because. 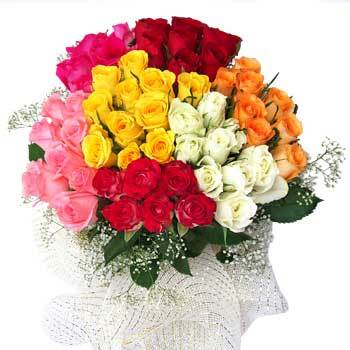 That way he or she will know the best way to create the right emotion with the flowers. If the flowers are for decorating or entertaining, describe the environment in which they will be placed, so that the arrangement complements the style and colors of the surrounding it will be in. It's easy to see that flowers can affect one's mood in a positive and uplifting way! Next time a family member, friend, significant other, or even yourself, needs a natural mood elevator, order some flowers to do the trick!